Inscription: COMPLIMENTS OF (ital) / Old Mission (slanted script) / Wine Co. / CENTRAL BRANCH / 36 SOUTH MERIDIAN ST. / Indianapolis, Ind. 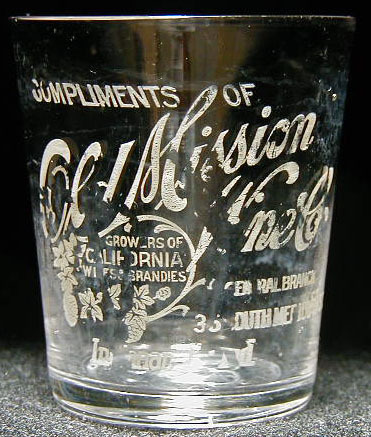 At left below "Old Mission" is a frosted grape vine wrapped around text: GROWERS OF / CALIFORNIA / WINES & BRANDIES. Dimensions: 2-3/16" x 1-15/16" x 1-7/16"
Condition: Not sure what happened to this one - there is no physical damage - but there is a hazy deposit on the inside of the glass and the glass must have been dirty when etched because the label has dropped off in places. So much for pre-pro quality control!